One of four armed robbers who attacked a forex bureau at Kaneshie in Accra Wednesday afternoon has been shot dead. The three others are being hunted for by the police. One other person, who attempted to stop the four armed robbers from escaping was also shot in the mouth by the robbers. He has since been rushed to a hospital for medical attention but it’s not clear whether he would survive. Eyewitnesses told TV3 Online that the four robbers jumped on a motorbike to escape and on reaching the Shell fuel station, scaled a wall into the premises of the Royal House Chapel near the Obestebi Roundabout where they shot a security man in the mouth. A police officer who was on duty at an insurance company near the place moved in and shot one of the robbers dead as they tried to scale the wall. 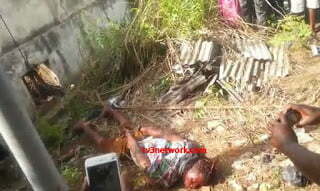 One of four robbers who attacked a forex bureau at Kaneshie in Accra Wednesday afternoon has been shot dead. The three others are being hunted for by the police.